From 1-25 August 2008, I returned to Akimiski Island to help Masters student Lisa Pollock of Trent University collect shorebird data. I thank Research Scientist, Ken Abraham of the Ontario Ministry of Natural Resources for this opportunity. Photo above: Female Polar Bear and three cubs on 23 August 2008. Akimiski Island has most the southerly Polar Bears in the world. White-rumped Sandpipers and Semipalmated Sandpipers at high tide. 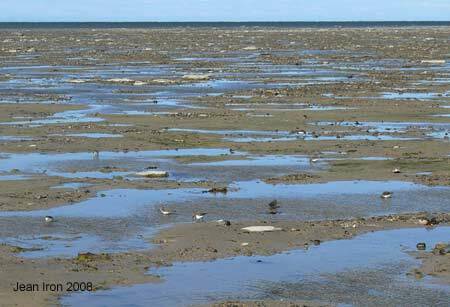 The outgoing tide exposed wide mudflats and small pools teaming with invertebrates. 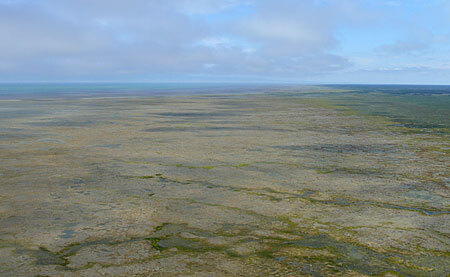 Thousands of southbound Arctic shorebirds stage here en route to wintering areas. 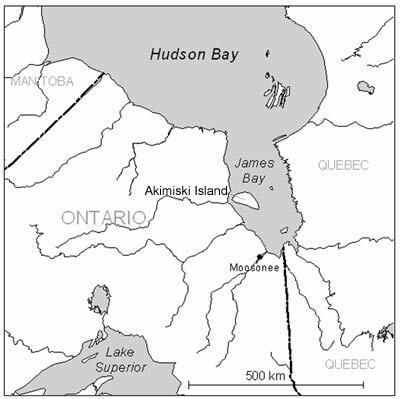 The north shore of Akimiski Island and those of James Bay are of hemispheric importance to shorebirds. 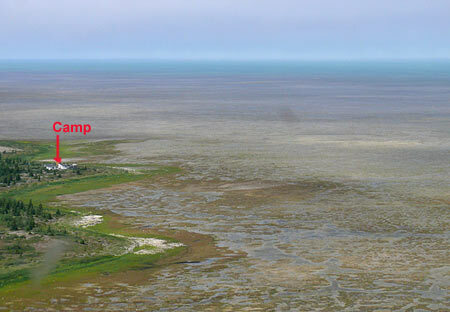 Vast tidal flats near camp. 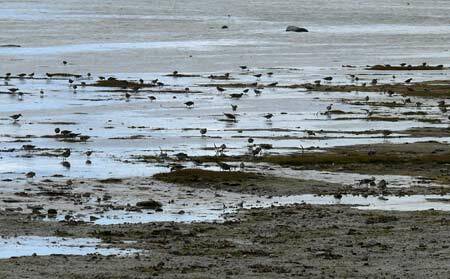 Shorebirds spread out at low tide over huge areas. As the tide came in, they concentrated along the leading edge. 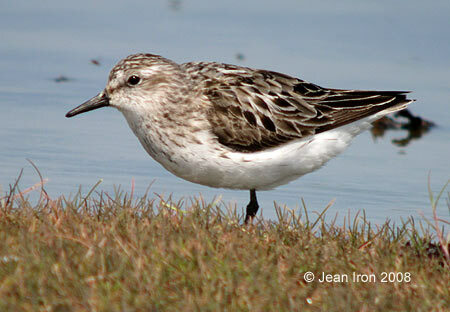 White-rumped Sandpiper was the most abundant shorebird. On 9 August, for example, we counted 4693 from our one site. 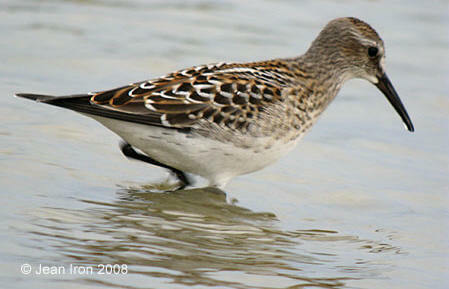 Above is an adult White-rumped Sandpiper molting to basic (winter) plumage on 3 August 2008. Juvenile White-rumped Sandpiper on 20 August 2008. First juvenile seen and banded on 19 August. 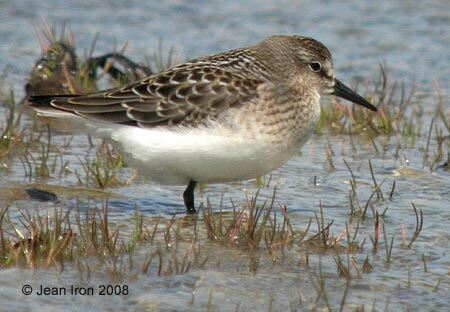 Semipalmated Sandpiper was the second most abundant shorebird. On 9 August we saw 3316. 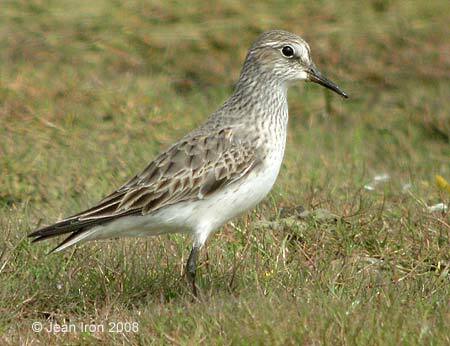 Photo above: Adult Semipalmated Sandpiper showing limited molt to basic (winter) plumage on 21 August 2008. Juvenile Semipalmated Sandpiper on 4 August 2008. First juveniles seen on this date. End of page 1. Go to page 2.